The survey of Old-Drava’s biological status brought new results. Species and habitats of European significance in and along the oxbow, are traced regularly during the monitoring. The annual survey give a unique and comprehensive picture of the Old-Drava, for which previously no opportunity existed. The oxbow’s most important habitats are aquatic plant communities and softwood gallery forests. These habitats are situated in an approximately 100-hectare area, which constitutes one-third of the whole oxbow and its environment. The oxbow has several sections where the rising water level is expected to have a greater effect on riverside habitats. We have taken samples on these sections separately so that results regarding better water supply can be monitored with more accurate methods. The monitoring includes those species that are most characteristic of the of the oxbow’s condition and the slowly flowing waters. The Old-Drava’s most common natural habitats are riparian willow-poplar forests, which cover 72 hectares. In these forests, besides several valuable tree species, the undershrub’s diversity is typically high, with the current status consisting of 30-40 species. During the spring observations, the rare military orchid, narrow-leaved helleborine and white helleborine appeared. This reflects the oxbow’s outstanding natural values. The presence of alien species was not considerable in the investigated gallery forest communities. Weeds, such as white helleborine (Cephalanthera damasonium), narrow-leaved helleborine (Cephalanthera longifolia) and military orchid (Orchis militaris) constituted 10% of the complete list. Every month from the spring of 2017, surveys on the field have been done to better understand the dragonfly fauna. 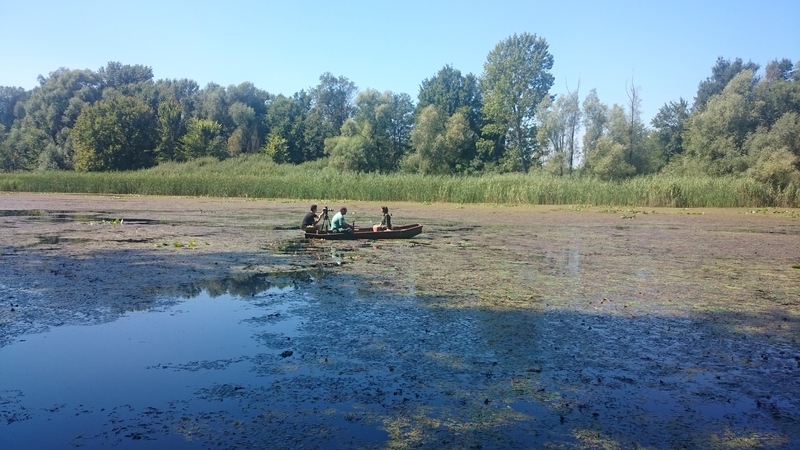 Five sampling sites on the Old-Drava were marked out to represent each typical part of the water, to ensure that the survey gives a representative picture of the Old-Drava’s dragonfly fauna. Altogether, 23 dragonfly species were proven to exist in 2017, which represents 35% of the species known in Hungary. On the sections with the most abundant number of species, more than 600 individual dragonflies were observed during the surveys. The observations prove that the Old-Drava’s biological state is excellent and especially favourable to dragonflies. The results also highlight that the dragonfly species’ composition can change year by year. Therefore, many years of data are needed to accurately survey the dragonflies presence. The river’s fish fauna were examined twice on several sections. Sampling sites were marked out so that shores be as varied as possible to ensure that the results are sufficiently representative. During the two-day fieldwork in two different seasons, 953 fish were caught and defined altogether on 7 sampling sites. Out of the observed 22 species, 4 are protected and also considered species of the Natura 2000 network list: the cactus roach (Rutilus virgo), the white-finned gudgeon (Romanogobio vladykovi), the European bitterling (Rhodeus amarus) and the Danubian spined loach (Cobitis elongatoides). It is significant that the protected European bitterling (Rhodeus amarus), which has a high natural value, was found to be the third most common species (14,4%). But it is regrettable that there are also two adventive fish, including the pumpkinseed (Lepomis gibbosus) which was the second most frequent species (14,7%) in the samples.The most common fish species in the standing waters and streams was identified as the roach (Rutilus rutilus), and constituted more than a third of the catch. The rudd lineage (Scardinius erythrophthalmus), which likes standing water, the common bleak (Alburnus alburnus), the silver bream (Blicca bjoerkna) and the Prussian carp (Carassius gibelio) also seemed to be stable. Currently, The Old-Drava in Barcs is favourable to fish that prefer standing water, or both standing water and streams Fish that prefer flowing water appear only occasionally. During the survey in 2015, the presence of 8 amphibian species was confirmed. In respect to reptiles, only the sand lizard (Lacerta agilis) and the dice snake (Natrix tesselata) was identified. The surveys’ results clearly indicate that both the amphibian and reptile fauna are characterized by a low number of species and by a low head count for the species that exist.. The reason for that is likely to be that many terrestrial predators or omnivores (boar, fox, badger, otter) are present on the shore, and a significant number of pumpkinseeds (Lepomis gibbosus) and black bullhead catfish (Ameiurus melas) feedi on the amphibians’ eggs and spawns in the Old-Drava. Surveys were continued by using variable sampling methods in March and in April in 2017. Based on the results, we can continue to confirm the triton species presence in the Old-Drava cannot be excluded, but if they occur in the water, the number might be very low. 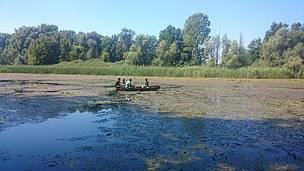 During the far-reaching work done in 2017 on the Old-Drava and its environment, members of other species that had not appeared during former surveys were identified or observed indirectly. These include the common spadefoot (Pelobates fuscus), the European green toad (Bufo viridis), the European green lizard (Lacerta viridis) and the slow worm (Anguis fragilis). The results of the 2017 monitoring also proved that Old Drava’s amphibian and reptile fauna is are characterized by a low number of species and by a low head count within the species identified. The ferruginous duck (Aythya nyroca) is likely to be a potential nesting bird, as bird pairs are often seen in the middle of May. Three pairs of the little grebe (Tachybaptus ruficollis) were sighted in 2017, which is low concerning the habitat conditions. Among the common little bittern (Ixobrychus minutus) there were at least 2 nesting pairs in the area in 2017, but the number of pairs is certainly higher. Numerous individual sightings of the black-crowned night heron (Nycticorax nycticorax) presume a nearby nest colony. The purple heron (Ardea purpurea) is the most valuable bird in the area and ornithologists estimate that there were 7 pairs in 2017.